When our dear leader, Fred Brizzi, sent out a call to writers with game codes, one of the games caught my eye. 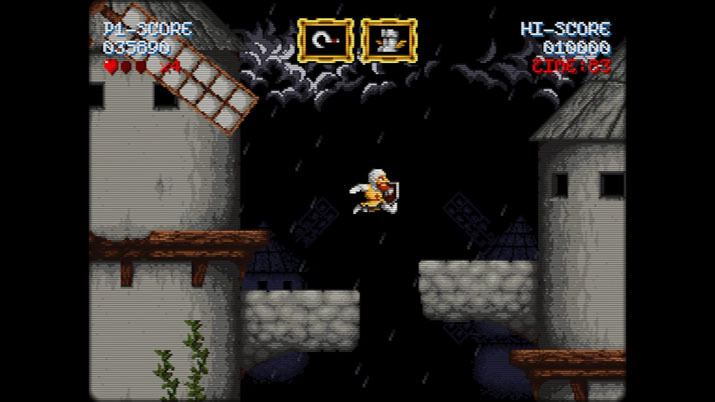 Watching the trailer for Cursed Castilla on its Steam page, I felt low-levels of nostalgia (this was constructed, we will later see), but more immediately, a strong sense of déjà vu. "Cursed reminds me of that game… what was it called again?" I thought. It was easily one of the hardest games I had ever played. Sure enough, a quick search for "hardest game snes" turned it right up: Super Ghouls 'n Ghosts (herein simply "GNG"). I wondered if the current game, Castilla, was anything like GNG, so I decided to pull the trigger. "Cursed Castilla looks great! Very reminiscent of Ghouls N Ghosts. Is the key still available?" I enquired. "Cursed is yours!" Fred replied. He sent over the key and, in turn, sent me on a trip down memory lane. The game is a tour-de-force of hard work. Ken McKown, Editor-in-Chief of ZTGD, writes, "It's clear from the start the love and care poured into this game." This is surely due in large part to the chemistry of the development and publishing teams (unlike Demolish & Build Company 2017). For their part, Abylight, the Spanish publisher (Spanish-as-in-Spain), has received shout outs from Nintendo for their hard work on other titles, and Locomalito echoed these praises, commending Abylight on their tireless efforts and insightful contributions to this Castilla port/remaster. The developer duo, Locomalito and Gryzor87 (let's call them "LNG") are a pair of arcade enthusiasts rowing towards their own green light, recreating games of old because, in their words, the ones "that we liked disappeared completely and then we started to miss them." They seek to satisfy "the craving" of old-school games, and by any measure they seem to be achieving this goal; check out the (also) vintage-style Shooter "Hyorah," an earlier LNG-collaboration, to get a taste for their work. Gryzor87's music is rich and outstanding. 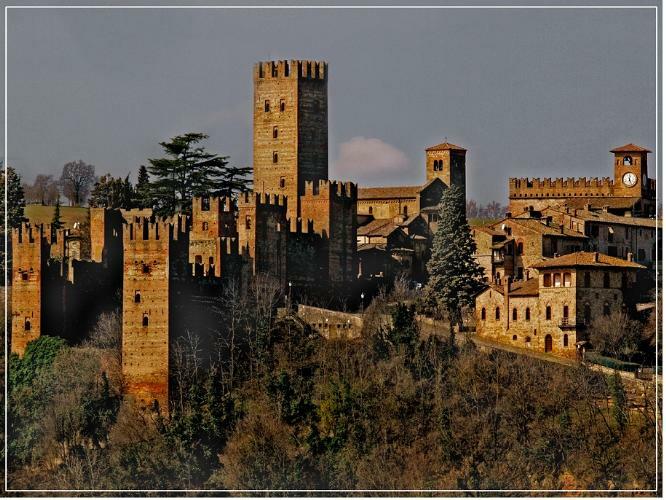 If you give a listen to his orchestral suite "La Suite des Morts," inspired by his trip to Castell' Arquato, you begin to appreciate the grandeur of his work. It's almost too rich for this game, but I say almost because, of course, Castilla's audio is deliberately nerfed to mimic the chiptunes of yore, creating a truly authentic experience of the arcade days of GNG and its ilk. We should take a moment here to talk about GNG. 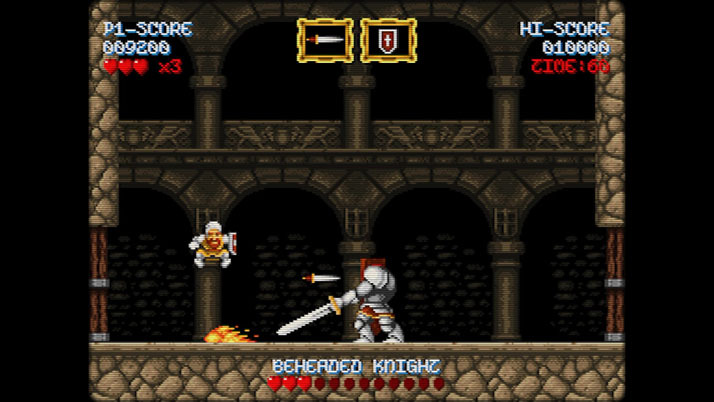 GNG is a descendant of the "Ghosts 'n Goblins" lineage. Also known by its more menacing, albeit slightly confusing, Japanese name, "Demon World Village," GNG is in league with Battletoads and Silver Surfer when it comes to difficulty. This isn't an accident. While describing Castilla and GNG to a coworker, he mentioned Black Tiger - a rather prescient observation, it would seem (kudos, Eli!) – and lifted the curtain on the deliberate difficulty: It's all about the money, honey! GNG & Black Tiger were initially arcade games, which meant that each life cost you, literally. 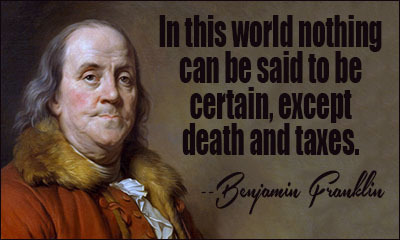 Perhaps arcade games are what Benjamin Franklin had in mind when he came up with his aphorism on death and taxes. For those of you who haven't played, you may find yourselves thinking, "Rey, how damn hard was GNG?" Very. I love a good challenge – I play video games competitively – but I was only able to beat GNG since I played it on an emulator and had the power of save states on my side (I highly recommend any reading to get the emulator Higan by byuu - it is an overly-engineered masterpiece). But don't take my word for it. GNG is so hard that the world class speed runner Patrick 'PJ' DiCesare made 3,345 runs and was only able to make it to Stage 11 (of 16) six times. Six. That's 0.18 percent rate of success. PJ took this in stride, and did mention that "a lot of people say that [GNG] is so cruel and so merciless to run." Finally, to drive home the mind-numbing, unforgivable challenge of GNG: GNG only had 8 stages. So why did I just write that there are 16 stages? Because when (or if, quite honestly) you beat it the first time around, the princess at the end says ‘JK LOL, you actually have to re-beat the game.’ And if you die the second time around, that's too bad for you: you don't restart from the second run, you must do the whole thing over again. Fortunately, Castilla is much more forgiving. You have 3 hearts instead of GNG's 2-hits-to-death, and you can even replenish those hearts throughout your journey. And you won't need to fuss or muck about to find the treasure chests which contain the proverbial health-restoring-chicken-legs either, since Castilla simply lays all the chests out in the open. Almost too easy, I thought, but then again, the hidden chests in GNG that are triggered by jumping in specific locations are just inane. I mean, really? How the hell would I know to jump there? And, when Castilla’s chests drop weapons, you can wait for the weapon tile to change to your weapon of choice, rather than forgoing an undesirable option, as you might in GNG. Like GNG, you will die, a lot. But fear not, because LNG has a soul, and you can restart without losing your progress as often as you will need to. The resemblance between Castilla and GNG is not lost on the gaming public. Many people point this out quite readily. Calling it "heavily inspired," as Kieren Hawken of GameSpew has, is a contender for understatement of the century. Castilla is GNG in the year 2016. I think I would be the first, however, to point out that this game also draws quite a bit from Data East's Joe & Mac. Especially between the bonus levels, vertical stages, and the frequent mini-bosses - more than twice the count in GNG - Cursed Castilla could be said to be as much Joe & Mac as it is GNG. But, that everyone thinks ‘GNG’ when they see Castilla only means that LNG succeeded in their mission: to create a game with the "look and feel of an arcade game from 1985-1987." That's a very specific date range, especially considering that GNG was released for the Arcade in '85, and Black Tiger in '87. But you don't need to put on a tinfoil hat: LNG directly cites these titles in a "Developer Diary" video, and they even give a nod to Data East, though Joe & Mac wouldn't be released until 1991. Castilla is an engrossing experience in its own right, however. One need look no further for depth than at the sheer number of enemies in the game – so many that LNG created a "Bestiary" specifically for this remaster (#humbleBrag). In total, there are "48+" types of enemies (so, 49? ), and they are 48+ different kinds of ugly, just like GNG (with the final boss in particular being one ugly mother). The grotesque imagery combined with the moments of occasional bullet hell risks overwhelming the player at times, but the artistic and thematic one-voicing just holds it all together. The visuals don't straddle the wanton anarchy of 1990's website design as heavily as those of Black Tiger, but they're not too far removed from it, either. As of December 2016, 100% of the Steam reviews are positive. Add my review to the pile. Cursed Castilla is, objectively speaking, a good game, even if you are not a fan of the genre. I would recommend one thing, however, much to the chagrin of OPNoobs Executive Producer Shane Gamez: play this game with a controller. "That's one of the things that really pisses me off… If I'm on a PC…" fumed Shane, "…I want my keyboard, I want my mouse," chimed Fred (Brizzi), capping off Shane's sentiment.